This section may not be of interest to those who reside outside of this state. Welcome to the land of the brave and the home of the free. 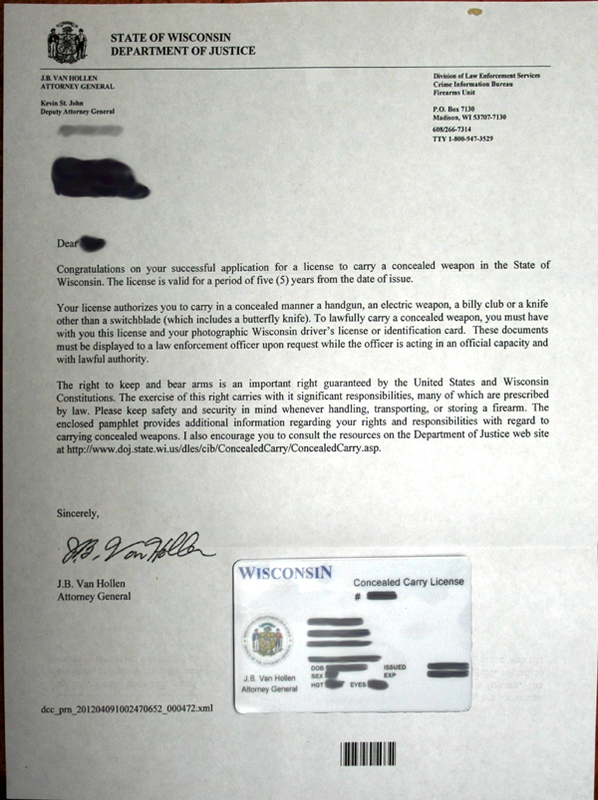 On July 8th, 2011, Governor Walker signed a bill authorizing issuance of a concealed carry permit for Wisconsin residents. The measure passed the state senate by a vote of 25 - 8. 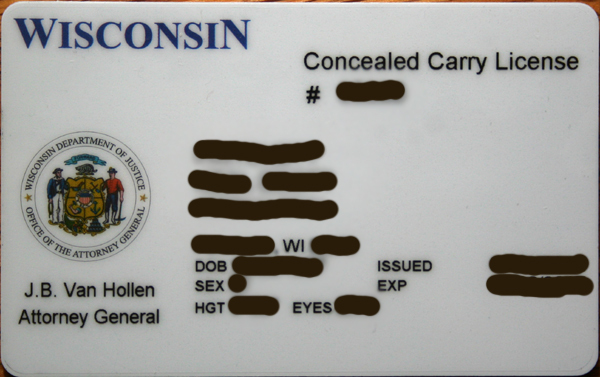 On November 1st, Wisconsin became the 49th, and perhaps the last, state to authorize issuance of a citizen concealed carry permit. Right to keep and bear arms. Section 25. [As created Nov. 1998] The people have the right to keep and bear arms for security, defense, hunting, recreation or any other lawful purpose. With the long overdue passage of concealed carry in Wisconsin, there is only one state left which has no provision for its subjects to become citizens, entrusted with the right to keep and bear arms. The remaining non carry state, illinois, gave us obama and hillary clinton, as well as a long line of other corrupt, criminal, and pandering politicians. I don't hold out much hope for such a place. In addition to the Constitutionally impaired state of illinois, there are eight states that have a form of concealed carry permit; but are permitted to deny or approve the recognition of this Constitutional right, at the whim of local officials. On the bright side, there are five states that allow carry with no permit at all. The requirements for the Wisconsin permit are pretty simple. You must be 21 years of age or older, and a resident of the state (no out of state permits are being offered at this time). You must not have a felony record, or any history of mental illness, and can not have any record of domestic abuse, or a dishonorable discharge from the military. So far, these are the exact same requirements as those for handgun ownership. In addition, the permit holder must have either had military or police training, a hunter safety course, or a four hour course specifically regarding concealed carry. No photograph or fingerprints are required. There is also no live fire required. A Wisconsin permit is one of the easier permits to get, which is a two edged sword. On the one hand, I took a four hour course, spent about fifteen minutes filling out some papers, and got my permit a few weeks latter. The permit does not even have a photo, though state law requires that you always have both the permit and a photo ID when you carry. On the other hand, the less stringent requirements mean that there are a number of states that do not recognize the Wisconsin permit. A two tier system was originally envisioned, with either no permit, or an easily granted permit for carry in most places, and then a more stringent permit which would permit carry in school zones, posted no firearms establishments, and perhaps state buildings. Such a more stringent permit would likely be honored in at least another ten states. For better or worse, this never did happen. 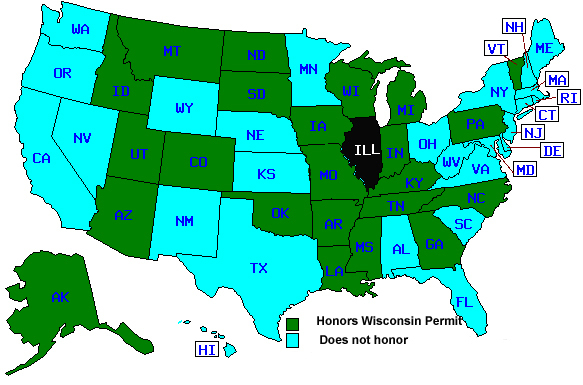 A map of the states that currently (July 2012) honor the Wisconsin permit is shown below. The most distressing omission, is that of the state of Minnesota. The most surprising omissions are of the ordinarily gun friendly states of Nevada, New Mexico, Wyoming, and Texas. It is also somewhat surprising to see the Southern state of Alabama not honoring the Wisconsin permit. Four of the states that "honor" the Wisconsin permit are four of the five Constitutional (No Permit) carry states of Alaska, Arizona, Vermont, and Montana. The fifth no permit state, Wyoming, does not honor the Wisconsin permit, and has permitless carry for its own citizens only. There is federal legislation pending to impose reciprocity of CCW permits on the states. This would be similar to the reciprocity of driver's licenses, where my Wisconsin license will permit me to drive in any other state. Many firearms advocates are supportive of this; but I have mixed feelings. Federal regulation of this could mean the imposition of federal standards, and eventually federal restrictions. I also have my doubts as to whether this would be Constitutional. I would prefer if a number of the states would get together themselves, perhaps at a governors conference, and work this out. What they might do is determine a set of standards, and then all sign on to them. This would keep the federal government out, and give individual states the ability to opt in. There is a call to have a stricter set of standards imposed, for issuance of permits. This is being called for by a number of liberal members of the legislature, as well as the liberal Milwaukee Journal and other state newspapers. Interestingly, this could benefit Wisconsin gun owners, by forcing upon the state a more stringent set of standards that would gain the Wisconsin permit recognition by more states. The ideal would be if it would inspire a return to the old two tier concept that was first being considered by the state. This would, if properly implemented, be the best of both worlds. You could easily get a state carry permit, and would have the option for the more stringent permit for reciprocity purposes. Under the present system, a Wisconsin resident has the option of getting non-resident permits, which would be accepted in a larger number of states. The most popular are those from Florida or Utah. A permit from either state is honored in 36 other states, as opposed to the 22 states honoring by the Wisconsin permit. Florida and Utah both require live fire, fingerprints, and photographs. I foresee the next generation of Wisconsin permits having photographs. The current non photo permit is likely an expedient for the large numbers of applications the state had expected to receive. Once things calm down, and more elaborate system may be put in place. Though things are always subject to change, the current permit is fairly loose, and allows a wide latitude of freedom. While most people consider the carry permit to be for a handgun, it also authorizes carry of a knife, club, or electric stun gun. Pepper spray may already be carried without a license. Possessing a carry permit exempts the holder from the thousand yard school zone law. It does not allow the bearer to bring a gun onto school grounds, however. Universities and private schools are under no such restrictions, though you can expect them all to be posting their properties. The permit allows the bearer to carry in establishments that serve alcoholic beverages, including taverns. Many states do not allow this. There is a restriction against drinking while carrying. It is best to look at a carry permit in the same light as a driver license. You don't drink while you are driving, and you don't drink while you are carrying. The license does not exempt hunters from DNR requirements. As an example, you must still unload before crossing a roadway. It also does not exempt the bearer from federal laws, such as the prohibition to carry firearms into a post office and other federal buildings. The state has also listed a number of specific prohibitions on concealed carry; but the list is easily summarized. You may not carry into a court or courthouse, a station or office of a law enforcement agency, a jail or other correctional facility, or a secured mental health facility. This should all be pretty common sense stuff; but it's nice to have things spelled out. Any property owner, private or commercial, may post property as banning firearms. A householder may prohibit you from entering the household while carrying. Businesses may prohibit carry, as well as state and county buildings. Your place of employment has the right to prohibit weapons. In all cases, these prohibitions do not extend to your car. 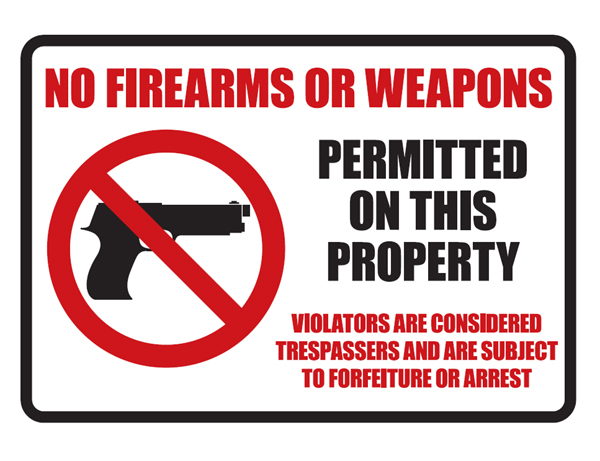 Though prohibitions may be verbal, in general public places should display a sign indicating that firearms are not allowed. Such a sign must be posted at every entrance, in a clear and prominent place, and measure at least 5" x 7". If you are given verbal warning that the location prohibits concealed carry you must leave, but are otherwise not culpable. If a sign is posted and you are discovered carrying, law enforcement may be called, and you may be cited. Wisconsin law enforcement officers and agencies are adapting to the new law, and coming up with procedures to minimize tension when dealing with legally authorized concealed carry. As a citizen, you are expected to inform the officer, politely and in a non threatening manner, that you have a permit and are carrying a weapon. Most police officers will not have a problem with this, as long as you appear non threatening and are not otherwise a subject of suspicion. You are required to have your permit, and an official photo ID on your person any time you carry. If you do not, you will be arrested, as there is no way to prove you are carrying legally. It may also be cause for suspension or revocation of the permit. The vast majority of working police officers support citizen concealed carry; but are in a very dangerous profession, and have a heightened awareness and self protective instinct. The best thing you can do, for both parties, is cooperate, leave your hands where they can be seen, and act in as non threatening a way as possible. Above all, never reach for your gun, or expose it, unless specifically asked by the officer. 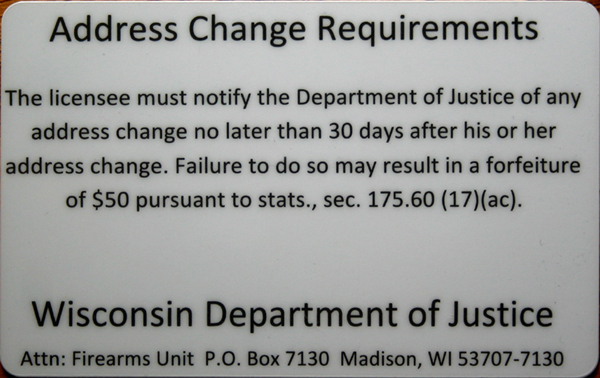 As of this writing, a Wisconsin permit costs $50, and has a training requirement that can be satisfied one of several ways. A specific training course for concealed carry will qualify, as will military training, or training as a police officer. Controversially, a hunter safety course, which requires no live fire, will also qualify. At the time of the bill's passage, this was considered the best compromise between those that wanted more stringent qualifications, and those who called for a permitless "Constitutional" carry. There is no photograph or fingerprinting required. The application can be downloaded at the link at the top of the page, and consists of several pages, though only the first page needs to be filled out. The other pages are notices an disclaimers which must be read and signed. The other requirements are no different than those required to own a handgun, namely that you be over 21, not convicted of any felony, or adjudged mentally deficient or disturbed, and you must not be adjudged as user of an addictive substance. In addition, you can not have been dishonorably discharged from the service, or have a history of domestic violence. If you can not fulfill all of these requirements, you are effectively banned from owning a gun legally, so it should not be much of a surprise that you can not get a permit to carry. I suppose the reason for the redundancy is that a permit also allows you to carry a knife, club, or stun gun, which are not as strictly regulated as firearms. If everything goes well, you pass all the requirements, and you fill out your form out properly (and the check clears), a few weeks latter, you get a letter from the state. The letter is a sort of a congratulations and welcome to the club type, and has the permit card itself, affixed to the bottom. Also included is a small pamphlet outlining the rights and responsibilities, as well as the regulations regarding concealed carry. It should be noted that without a permit, open carry is still allowed in Wisconsin. I mention this, because there are a number of people in the state who are upset that Constitutional carry (requiring no permit) did not pass. Many say that we should not need a permit to exercise a right guaranteed in The Constitution of the United States, and reaffirmed in the the Wisconsin Constitution. While I agree to a certain extent, technically, unrestricted open carry would fulfill the Constitutional requirement that people be able to keep and bear arms. At any rate, I am pleased to be able to exercise this right, though I have only carried twice, so far, mostly just because I could, and to see what it felt like. Yet in the future I know I will carry from time to time, particularly in places or conditions in which I may not feel completely secure. Looking for a fight? No; but no free citizen in a free society should ever be fearful for his safety, due to constraints placed upon his ability to defend himself. Similarly, no free citizen of a free society should be afraid to walk the streets of a civilized nation at any time of the day or night. While it is more prudent and less troublesome to run from a fight, you can only run so far and for so long. We have already been running for decades, out to the suburbs, behind gated communities, up into high rise apartments with secure lobbies, and behind the protection of security systems and ever more invasive police policies. Now perhaps we can stop running, and might even stage a return. In contrast to the Wild West scenario that gun control advocates always propose, firearms may permit a return to the level of civilization and civility we once enjoyed. It's worth a try, and certainly can't do any worse than what we have been trying for the last several decades. Hey - if it will save the life if a single child.